Gilly remembers, as she was pregnant with her son Jonathan, that Newton School was closed around 1966. After her son started at Harston School she asked the Headmaster, then Peter Shoot, if there were likely to be any General Assistant jobs and there soon was. She started in September 1971, having had to do a few weeks unpaid at the end of the summer term to learn the ‘ropes’. She has now been there for 45 years, and although at one time she took on the Secretary job, she preferred and reverted to the General Assistant job. She mostly worked with Mrs Askham in the infants. Then Mrs Wheatley taught Class two, Mary Sheil (nee James) had Class 3 and Mrs Jean Wainright had top Juniors. Mrs Jean Reed (nee Wilson) Class 4 and Mrs Hazel Percival came later. Also came, Mr Alan Ferguson, the first male teacher apart from the Head. Mrs Shoot was the Secretary. At various times Kath Rayner and June Vallis were school cleaners. Peter Shoot was very strict and from his office in the middle of the Old Victorian building he would watch everyone going about their jobs in classrooms, playground and hall, making sure no-one skipped off early. Mr Harry and Mrs Edna Shipp were caretaker and cook, respectively, and after the kitchens had been built around 1971-2 Edna would take Harry his lunch across into the school house where they lived – initially free – until told off by Peter Shoot. The schoolhouse was available for the caretaker as Peter Shoot lived in Newton. The kitchens and school hall were being built when Gilly started in 1971 but probably completed during the next year. There was very little parking in 1971 and the staff would park in the space in front of the school if there was room but once in you couldn’t get your car out till the end of the day. One day Gilly went out to find her car had been stolen from the front of the school, sadly having to admit she had left her car keys in it! After Harry Shipp retired and moved out of the schoolhouse, the new Headmaster, David Burroughs moved in around 1977/8. 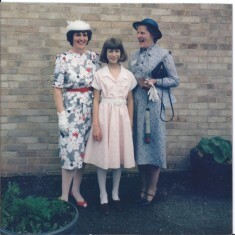 He started the first Parent Teachers Association (PTA) and in 1982 encouraged a school drama performance of ‘Carrots’ that many students, parents and staff took part in, Gilly as Dr Barnardo’s wife. Gilly has been involved for many years (from 1971 to present) in helping with raising money for ‘Save the Children’ fund that the school supports and has met Princess Ann, its patron 4 times, including in 1985 when she, Mrs Askham and a pupil presented the cheque at Jesus college. After David Burroughs left, Mary Askham acted as deputy Head running the school until Pat Legge was appointed in 1987? Gilly did her stint as School Secretary in the office but swapped back to General Assistant. The school office was first next to Mr Shoot’s office in the old Victorian block, then when Pat Legge was head it was at the eastern end of the infant block, later moving half way along the corridor in the infant block. 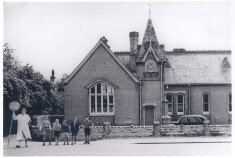 However, once the infant block was joined to the hall, the school office was moved to the side of the school hall entrance having temporarily been housed in a mobile in front of the hall. Gilly recalls: “When David Burroughs came he started school trips, money being paid out of PTFA. funds for day outings to museums, etc. 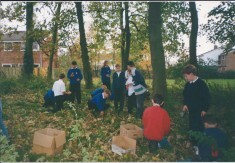 He also started educational field trips to The Broads during the October half term for the week. This involved three boats, each with 7 children (mainly Yr 6s) on board and one member of staf f- Gilly, Alan Ferguson, David Burroughs, and with an organised crew manning the boats. Parents had to pay for the children to go to cover food, fuel and other costs. The adults on each boat had to drive, then moor the boats and also cook the food (quite scary!) as well as look after your 7 children. We used to stop at certain moorings like Lowestoft and look around the fishmarket or see thatched churches or other sights. When Pat Legge arrived, the educational fieldtrips continued but we camped on school fields – a school in Walsingham was a great hit. One trip we had a terrific thunderstorm which was a disaster – tents leaking! We then had to retire and sleep in classrooms with blankets being borrowed from Walsingham Abbey, then waking the children early the next morning because the school had to be ready for 9 o’clock. The following year, and many years after, we resorted to Youth Hostels in Derbyshire and also Suffolk for a week at a time. I remember when we sadly lost a beautiful little girl, Victoria Ford, who had been ill for a while. In memory of Victoria every child and members of Staff planted a daffodil at the back of the infant block. We all look forward to Victoria’s daffodils in the spring and I know Mrs Legge (headteacher at the time) still bikes round to look at the flowers.